Capt. S.S.S. Rewari dedicated his life to the Indian seafarer from large maritime forums to simple, individual interactions. From sweeping changes in marine education to a single phone call to help a student in distress, for him the task was one and the same thing. To be a guru, guide and guardian to his students was of utmost importance and any pain on the face of a student reflected with pain in his own heart. He touched everyone in the most personal way. His association with the marine community began with the completion of his pre-sea training from T.S. 'Dufferin' in the ’53 – 54’ batch, where he secured an Extraordinary First Class. Capt. Rewari was awarded the President’s Gold Medal in 1962 standing first in the country in the Master Mariners Examination. He completed his Extra Master’s from Sir John Cass College, U.K. in 1968. In addition to gaining the highest marine professional qualifications, throughout his career Capt. Rewari was dedicated to continuous learning. 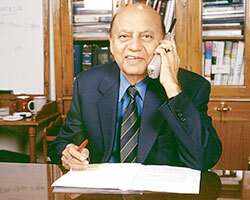 His interest in wider education is demonstrated by various additional professional courses which he attended : At the Jamnalal Bajaj Institute of Management, University of Mumbai he completed Trainer of Trainers Course; At the Indian Institute of Public Administration he completed a course in Training Methodology; and at St. Xavier’s Institute of Counselling, Mumbai he completed a course in Personal Counselling. Capt. Rewari began his career, spanning nearly five decades, as an active seafarer and progressed through a series of remarkable academic roles that have changed the face of marine education in India. 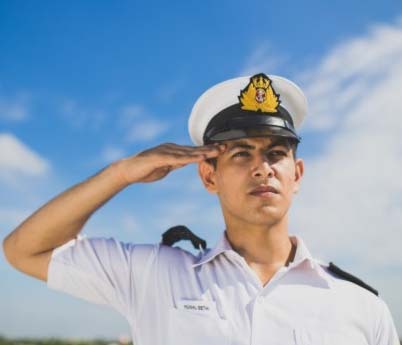 Captain Rewari’s career as an educationist began in 1962 at LBS CAMSAR (Lal Bahadur Shastri College of Advanced Maritime Studies and Research, formerly LBS Nautical & Engineering College) in Mumbai, as a Nautical Officer. Students recount how his lectures during that period were 'standing room only as he made even the most dry subjects interesting and full of life. His classes were open to all, each lecture different from the one before, each packed with as many lessons on life as on magnetism or ship stability. During his 8 year tenure as Vice-Principal, LBS College he was instrumental in the commencement of some key courses for the first time in India: STCW tanker course, Extra First Class and Extra Masters. In 1987 Capt. Rewari took the helm as Captain Superintendent of T.S. Rajendra (Now T.S. Chanakya). His years there will be best remembered for pioneering a full fledged degree program (BSc. Nautical Sciences), affiliated to Mumbai University. From that moment no graduate from this college would be denied access to higher education for want of a recognized degree. Capt. Rewari returned to LBS in mid 1991 as Principal where he revolutionized the institution through sweeping changes such as modernizing the curriculum; completely renovating the campus; installing a Full Mission Bridge Simulator and Cargo Simulator, and arranging procurement of a Full Mission Engine Room Simulator. CaptRewari’s energy and dedication drove him to continue an active professional life after retiring from LBS, when he assumed the post of Director, Marine Education and Training, FOSMA and moved to New Delhi. At ARI, his greatest success was in building an organization capable of delivering enduring quality which will stand the test of time. To enable this he put to use a remarkable knack for assessing people, building on their strengths, thereby creating an excellent team with each faculty member carefully chosen and groomed by him. The ARI family today is more than 300 people and Capt. Rewari enjoys the love and loyalty of each one of them. He was affectionately known as ‘Uncle’ to a large and talented team of mariners, HR professionals, trainers, technologists and managers. The team that he groomed during his time heading ARI is a strong and dedicated force. They have learnt from him his ideals and have shared his dreams. As the future unfolds, they aim to move marine education to yet a further plane. Capt. Rewari always welcomed change, and as ARI builds on the strong foundation of solid maritime education, with ARI's expertise in technology and HR, new developments and changes will continue. The platform for growth that he established will be of immense value for years to come, and his legacy will be carried forward. The greatest honour concurred upon Capt. S.S.S. Rewari was the Varuna Award, posthumously awarded to him in 2004. This highest honour by the Ministry of Sipping, Government of India marked the contribution of Capt. Rewari in maritime education and training throughout his lifetime.